Five dedicated families founded Stony Point Reformed Presbyterian Church in the Bon Air suburb of Richmond, Virginia in 1969. A big part of its steady growth and support has been its strong commitment to motivating and punctuating services with fantastic music in an ever-changing variety of contemporary and classical styles. In short, music is a big deal at Stony Point. Different bands play each week with a lot of reliance on the congregation’s many musically talented individuals. When the church built a new 500-seat sanctuary, everyone wanted a fabulous new sound reinforcement system that could help elevate the impact and emotion of its services. In consultation with the Richmond-based AV integration firm RTW Media, Stony Point installed a robust LCR system composed of Danley Sound Labs loudspeakers, subwoofers, and DSP-enabled amplifiers. 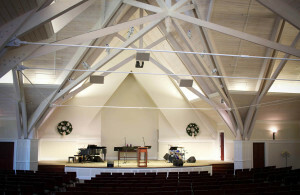 “Despite all the incredible musical talent at Stony Point, the old sanctuary had less-than-ideal sound reinforcement in a challenging acoustical environment,” explained Ross Milby, who has volunteered as Stony Point’s FOH engineer for over a decade. Milby worked with RTW Media on the design and installation of Stony Point’s new sound reinforcement system. “RTW’s Logan Hinnant, who interfaced with the church and architect, was incredibly helpful in navigating us through the design process.” The experience was so great for both parties that Milby joined RTW Media’s team as a regional accounts manager. Stony Point went with an LCR system so that Milby could mix vocals and spoken word to the center channel and spread out the musical instruments between the left and right loudspeakers for maximum clarity. Three point-source Danley SH-69 loudspeakers comprise the LCR system, with low-end support from a single Danley TH-118 subwoofer underneath the stage. “I was skeptical that a single TH-118 could provide enough low end for the size of our new sanctuary,” said Milby. “But I was blown away! It sounds great!” Just a pair of two-channel Danley DLA 7500 amplifiers powers the system, with loudspeaker conditioning supplied by optional on-board DSP. A Midas Pro 1 digital mixer provides user control for the system, and two portable Midas DL153 stage boxes connect the system to stage left and stage right.